When Mickey the Idiot first met the Doctor, he called him a “thing”. When Mickey Smith parted ways with the Time Lord, he called him “boss”. 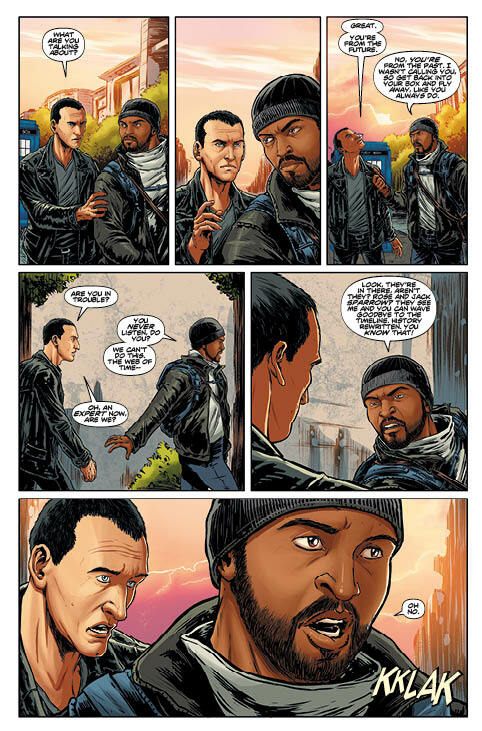 But in the fourth issue of the ongoing Ninth Doctor comics, their relationship takes a step back. Literally. 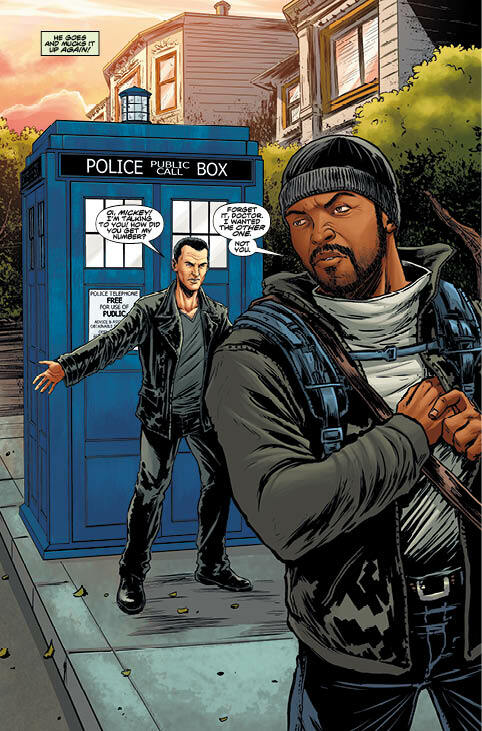 That’s right, the Ninth Doctor meets alien-hunter Mickey Smith (from after his ‘The End of Time’ cameo) in an absolutely cracking tribute to how much his character grew during his time in and out of the TARDIS. The dynamic between the Doctor and this version of Mickey is an absolute joy to read and delivers a pitch-perfect inversion of how their relationship started. This Mickey has no time to let the Doctor’s barbs get to him anymore and it’s a strange but fascinating touch to see the Doctor’s wit used to make him seem petty. Of course, there’s a smidge of fan-service by way of Mickey’s other half running into the Doctor in a way that cleverly maintains continuity. I kinda wish Martha had been given more to do in this issue, especially interacting more with Mickey since we only saw the husband and wife exchange a handful of lines. (How have they not had their own spin-off yet? Come on, Big Finish!). Then again, that probably would have taken the focus away from Mickey and bog down an otherwise well-paced adventure. But it’s not all Mickey Mouse and Big Ears this issue. Jack and Rose get a fair amount of panel time, though they’re kept away from future Mickey since this encounter is already pummelling the vortex. I particularly liked how Cavan Scott has written Jack here, during his pre-Torchwood days. The ‘man who can never die’ may have seen it all, but this non-immortal Jack can still be flummoxed by the weird and wacky things in the Universe. It’s refreshing to see a companion from the future who isn’t a know-it-all. Meanwhile, Rose is…Rose: if you thought she was flighty before just wait until you see what she does in this issue! My only slight quibble with the artwork is the character design on Mickey. 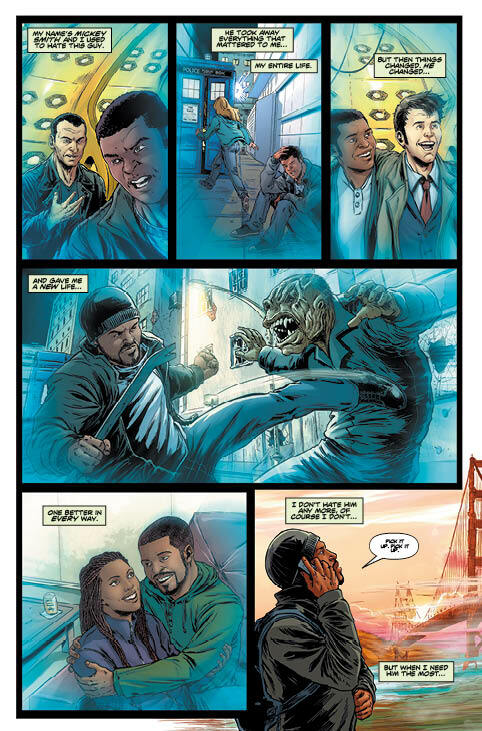 Whilst artist Adriana Melo has captured Noel Clarke’s face well, he’s tooling around San Francisco in a bulky coat and wool cap, just like the getup we saw him in for ‘The End of Time’. Whilst this helps to emphasise his place in the timeline, it comes off a little unrealistic. It’s also a missed opportunity to give Mickey a badass new alien-hunter outfit. Elsewhere in the artwork, Christopher Eccleston and Billie Piper are drawn very well though Jack loses out a bit in certain panels. This issue is a little thin on plot, but more than makes up for it with the conversations between the Idiot and the Doctor. There’s still plenty of action even if the narrative isn’t entirely there yet; it’s the first of a multi-part story, so a slow-burning issue one is more than forgivable when it gives us this gem of characterisation.